My family arrived in Atlanta over Labor Day weekend for their annual summer visit. My 90-year-old Mom and my 86-year-old Dad are real troopers for making the road trip to visit their number two son. I’m so grateful that they’re still able to visit. I purposely planned a relaxed agenda for the weekend so there was a good bit of sitting around, eating, some football watching, and a little shopping. On Saturday night, our best friends, Bruce and Felix, joined us for a cookout. Bruce’s sister, Bobbie, and her daughter, Brendall, came as well. I love mixing friends and family. There’s something about meeting your friends’ family that helps you know your friends better. I fired up the grill for burgers and made rosemary potatoes and grilled corn salad as sides. 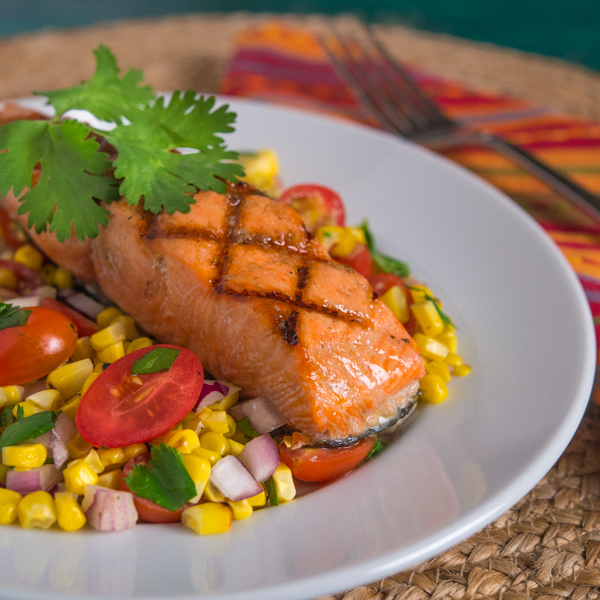 The corn salad made a big splash, so I’ve recreated the salad with grilled salmon for this post. The dressing makes this salad. I used lime juice, buttermilk, cumin, chipotle seasoning, and cilantro to create a delicious combination of flavors. The dressing recipe makes more than you’ll need for this recipe, but it will keep in the refrigerator for a week or so. We eat a lot of salad in our house and this dressing is great with most any salad. Combine all dressing ingredients in blender and process until well combined. 1. Preheat grill or grill pan. Brush corn with canola oil. Grill for 10 to 15 minutes or until kernels are starting to char. Cool and remove kernels with a sharp knife. 2. Mix corn, tomatoes, onion, and cilantro. 3. Add dressing to taste and mix well. 1. Preheat grill or grill pan. Brush salmon filets with canola oil and season with salt and pepper. 2. Grill filets for 3 to 4 minutes on each side. More time might be required for thicker filets. To test for doneness, press on filet. It will start to flake with done. 3. Serve immediately with salad. As one of the visitors from Labor Day Weekend, this corn salad was a hit!! Even though I’m not much of a health nut..I made an exception for this. Definitely worth your time in making it!! Thanks for a great night Bill! Terrific meal! That salad dressing looks killer – love the chipotle in it. So great your parents are still pretty mobile at their age. My dad is 92 and gets around OK, but he wouldn’t be up to visiting another city. Anyway, good post – thanks. Your salad not only looks super colorful and yummy looking, it’s healthy. Your parents sure are troopers, so sweet of them to visit. The dressing oh my, sounds delicious. Gorgeous corn salad Bill – colorful looking and totally delicious sounding! And if I made that dressing, this salad would not be shared! And you know what – we had salmon last night too!!! Did your parents drive or did someone drive them? Good for them to be able to even take a road trip at that age. I wish my mother could. I’d bring her out here in a second! Sounds like a lovely visit, lots of good food, friends and family! What a gorgeous plate of deliciousness! Yes, yes and yes to everything on that plate! What a fab meal Bill, thanks for sharing. This salmon looks delectable! Yummy! Gorgeous salad and I love the dressing. I just can’t get enough homemade dressing recipes.